Wow. I have tryed making blogger templates (i've sucseeded a few times! ), and that is a lot better than I can do! Also, my secret was to put on that "remove navbar" thing and the "search in this blog" thing, but now you have it!!! Can I put an image under the red banner?, how? I have a problem when using Mozilla Firefox (latest version). Some code still appear on the site, although the syntaz is ok and when viewing with IE, everything is fine. The profile should be hidden (in IE is), while in Firefox not and also the ########## REMOVE THIS LINE (2/2) TO SHOW THE PROFILE ########## --> appears :-( When I review the blog before publishing, it looks fine...but the real thing, not. What am I missing? Forgot to mention the blog site so that you can see it with Mozilla" salute2sun.blogspot.com. Great Template. Easy to customize. Not difficult to use. Though my only problem is that you have the CSS files on a different server and not embeded on the text itself. I just installed this template, and I am pleased with the look. How do I increase the font size? My father reads my blog, and he's 80 years old! On the standard blogger format, a reader can click on the title of the post and link to the article I'm citing. Right now, my readers can't link to anything. How do I fix it? I fixed the links. Now you can click on the post title and link to my citation. What I'd like to do now is change the colors of the post title back to orange and change the color of the post's footers to say, light blue. can you please post some code to integrate google ads in this template? should I insert it in a div block? I love this template a lot and has adopted to my blog! However, like MrAl memtioned above, you have the CSS files on a different server and not embeded on the text itself and that's a huge concern I'm having. I don't know when the server that hosts the CSS files will be shutdown or go bad. Is there possible for you to embed the CSS codes in this template? 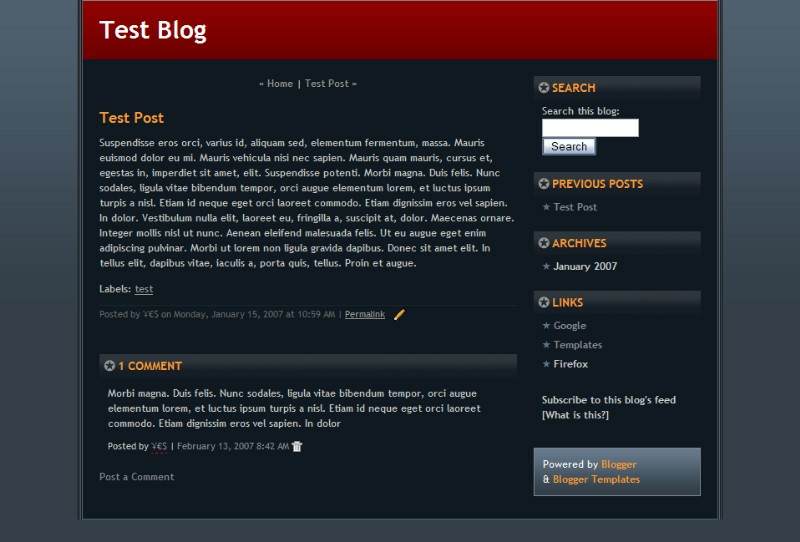 please, where did the old blogs templates go that were on this site? I really need a template code again to repair the old code (that i messed up). hi! template looks great. i'd also like to find out how to add an image under the red banner. thanks! Is there any chance you can send me curves-red.css, beckett.css and player.js to my email at least I will post it on a server of my own without using your bandwith. lol, nobody have this files? Yep, down, victim of its success. the css file were hosted on a free googlepage. Free has its limits "sometimes". Next time, i will copy it and host it on my own googlepage to avoid such incident. I had to use an other template loosing all the modif i made on it. never mind, i should have done the css file myself. Do I have to host all the css and all other files on the web somewhere, or is there a way to embed them in the code? Ok so I copied the CSS into my template. The one provided by the kind person who runs this joint. I do however have an issue now which I didnt have before, that is my sidebar. Could someone be a legend and have alook at my source to check what might be the issue. Even if I embed the .css, I still have to host the images somewhere though, right? what about player.js file?!?!?!?! anyone!!!! How is a krazy monkey from down under in New Zealand supposed to try and download a template when normal people have problems ??? A wonderful template. No need to search anymore. I really like how this looks, but I am afraid to put it in my template. Not sure what will happen, not sure if I have enough room, not sure if I will lose the stuff I already have. Is there a place in my template to put this? And just where the heck is it? I've been using this template for a few weeks with seemingly no problems. But now my readers are telling me that the background appears white, and certain elements will not appear on the screen? Is this a firewall/browser issue, or does it have to do with the template itself? Can anyone help? P.S. I have yet to witness any problems on either of my computers, but more than one reader has voiced a complaint. thanx a bunch! i'm loving the way my blog turned out...the transition from my old template to this new one was as smooth as possible...so easy. again, thank you!! i really like this template and i set it on my site but there is a prbolem.. when i click the permalink it shows the page in my old template. it also does this when i click comments. can anyone please help me? please! I'm having a slight problem with this template. At the topmost corner of my blog, there's some text that appeared. I don't know how to remove it! Can anybody please help. Please visit my blog jotuvillo.blogspot.com to see it. Thanks! is blogger having a problem? this template that i am using is not working properly. i have been using it for months, and today it has a white background and the sidebar is at the bottom. totally screwed up! white background and the sidebar is at the bottom. totally screwed up! The black/dark gray background does not show up when viewed through Firefox. It looks fine when viewed through IE or Safari, though. CAN SOMEONE PLEASE TELL ME HOW TO FIX THIS AGAIN?!?!?! why can't title of each post be hyperlinked? ,and edit css address in the template code,the index page of my blog displays OK,but after i click permalink button,it malfunctions. When i use the css file on that free google page, it always functions well on all my pages. I want to host all the files on my own site because of the fear for the collapse of the google server one day.I hope this site can provide all the files to us, not linking to other servers like googlepages. Yup, that's exactly what I see. Probably there is a problem with the CSS template used. I'm having the same problem. My sites looks AMAZING in Safari and IE, but very very simple and boring in firefox which is my surf of choice. Is there anything we can do to fix this????? PLEASE....PLEASE....PLEASE, this is the best template I have seen in years!!!! Though now i am using another template,i want to say i fixed my problem. The css's url should be < BlogUrl>/beckett.css,not beckett.css. If it is beckett.css, it only displays right on the index page. Simplicity is beautiful! Keep it Up! Nice template, very nice emulation of Ars Technica's site! Me ha encantado esta plantilla. Ya la estrené en uno de mis blogs. Mi consulta es por el famoso truco "seguir leyendo". No puedo colocar los cambios correspondientes dado que no tiene los mismos códigos de las plantillas comunes de blogger. Me podrías ayudar con ese tema? Hi, I would like to know how you do that transition when you click over the template sample, how is that animation made? My templaye looks awesome in Internet Explorer but looks very plain in Mozilla Firefox(like the pics the ppl above me posted). Would be great if you could fix that. How can I do to add a left column in this template?? Any new templates for Blogger Beta ? This template looks great in IE, but I primarily use firefox, and it doesn't look so good... I don't want to promote Internet Explorer, but I want this template. Any suggestions? Do you have the template in 1024X768 reso? how can i change the main menu to the left side?!?!??! PLEASE I NEED HELP !!! Just wanted to say thank you for this template (you've got the link to blogger template on my blog too of course). It's excellent and even matches my bike shoes (see first entry). Best regards! Thanks for the great template (perfect for my blog, and I love the black/red combo), but I get the same problem in Firefox that other people are describing. I also get the same problems in Firefox that others are describing. I'd like to keep this template because I love the way it looks and it works great for me, but unless someone figures out how we can fix how this looks in Firefox, I'm going to have to go with another template. How can i put an image in the top of the template? In the red banner for example. I want to know how to change the size of the banner and replace the red with a banner of my own. Anybody out there figure out how to fix the Firefox problem yet? I'm about ready to give up on it because at present this template looks like crap (sorry, but truth hurts) in Firefox. When I visit this blog in Firefox, the template looks right there. But that's the only blog with this template that I have seen in which the template works right. I love the look if this template, but I can't get it to work on Blogger. When I add the code to the HTML section under template and try to preview it, Blogger says: "
save the player.js file with it..
really good template... thanks a lot! Has ANYONE figured out the whole Firefox problem yet? I'd really like to get it fixed! "I had the same problem with that error back when I first switched my other blog over to Beta. To get around it, go to the page where you would paste in your code ('Template'), go to 'Edit HTML', scroll all the way to the bottom, and click 'Revert to Classic Template'. (This bullet item should be right below the code box.) You should then be able to post the code into the box without the error. Now, that was what I did to get the new blogger to accept the code for Top Secret. I'm not sure if that will do for Beckett. Last time I used this template I was still in old Blogger. For people with the Firefox problem, I'm not sure if it will fix this template, but I fixed the similar problems with the Top Secret template by hosting up the images and CSS files on my own server (see my blog here). Remember that you'll have to change all the relevant referants re the image and CSS locations. I love this template a lot and has adopted to my blog! so what should i do & how to upgrade my template. I don't want to change current design. Who can convert it ? When will you turn this template for the new blogger? Its a real decent looking template. WOW! This is so great this is the best template i've ever used! Great Template!! but I don't know how to put it in my blog... can someone tell me how to do it? and it should be a simple one but im not seing it at the template... color of the header... its red and i want it black.... any sugestions? Great template, but there's a problem with posting comments - only shows one, no matter how many are posted. I'd love to hear if someone has an easy fix for that. It's lovely and I hope you don't mind me using this although can I change the bullet design of stars? Thank you. did anyone emanded to convert this into a new blogger template? I'll post it on Webtalks.You can have a look on other templates there! How can I make the last posts be more? A very nice and clean looking template. I haven't had any problems doing some custom stuff to the page. Looks good with Firefox too. Really nice. I love this template and am using it too, why is there no edit links option on it? There are edit link comments -- scroll down towards the bottom, you can't miss them. I love this layout! Awesome design and colors. It made many of traffic. Alguien podría explicarme en español por qué no puedo instalar esta plantilla en mi blog?? Umm, dude? I, um, just put this into the place where the HTML goes, and, um... I can't sign into Blogger anymore, cuz the "Sign In" bar has mysteriously vanished. My name is antonioac owner of AC Investor Blog that uses this excellent template since 2006. At this moment I have a little problem, my side bar is full of content, therefore I would like to know if anyone of you can tell how can I add a new side-bar is this particular template.